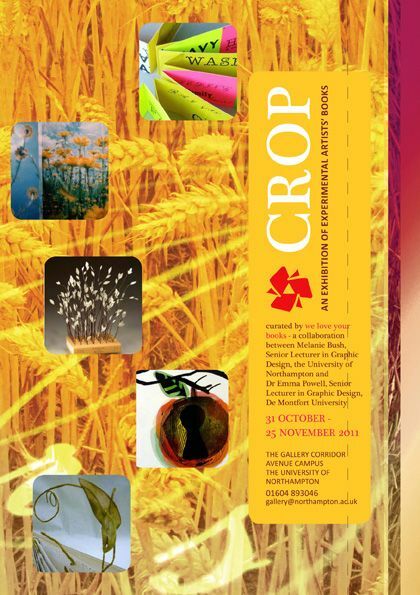 'Crop' is the 7th annual exhibition of experimental altered and artists' books, curated by Dr. Emma Powell (De Montfort University) and Melanie Bush (The University of Northampton) of the 'We Love Your Books' Book Art collaborative. This very popular event includes work by international book artists alongside work by students from both institutions. 'Crop' will be on display in The University of Northampton's main reception and Avenue Gallery corridor area - for more details contact Avenue Gallery on 01604 893046 or gallery@northampton.ac.uk, or take a look at the We Love Your Books web site.